To follow the story of the Mary Rose, this week we will look at another famous royal shipwreck. This time we need to travel much further north than Portsmouth and take a leap in time: on the 10th of August 1628, the Vasa sank in Stockholm harbour, thus ending the career of the most powerful warship that Sweden had ever seen. Unlike the Mary Rose who had seen countless wars and conflicts, the career of the Vasa had barely begun – sailing about 1.3 kilometres – before she sank within the sight of the shipyard where she was built, to the shock and dismay of the good people of Stockholm who were hoping to catch a glimpse of the glorious new vessel. According to contemporary accounts, the most direct reason is that water gushed into the open gun ports and flooded the ship. The same mistake doomed the Mary Rose, but whereas the Tudor ship was then engaged in intense crossfire in the midst of battle, the Vasa only just started her journey to war. The real factor that accounts for the ship’s wreck seems to be faulty design – and, it should probably be added, ambition and desire for glory. It has been reported that Söfring Hansson, the captain who was supervising the ship’s construction, warned the Vice Admiral Klas Fleming about the Vasa’s lack of balance, yet Fleming – hard pressed by the king – did not listen and ordered preparations to be made for the Vasa’s sailing anyway. An inquest was held soon after the tragedy, but the blame was put on Henrik Hybertsson, a Dutch master who designed the ship. Master Henrik died less than a year after the Vasa construction started, which made him the ideal scapegoat. Now you might wonder why the Swedish king would contract such an important ship to a shipwright who had made such a mistake. But the truth is that, though a first-class shipbuilder, the Vasa was something quite new to master Henrik. When Gustav II ambitiously started building his navy, Swedish navy tactics were undergoing some change. You see, in the Mary Rose’s time, the main tactic was to board the ship and fight – and, ultimately, to capture the ship, because obviously it would be your gain and your enemy’s loss; therefore, you would prefer as little damage as possible. But Gustav wanted his warship to be war machines; the goal was no longer to take the ship, but to gun her down. As a result, the Vasa carried a much greater number of heavy guns and canons than her predecessors – and those that came after her, as a matter of fact, for orders of such big, heavily armed ships were cancelled immediately after Gustav II’s reign. Able to fire 250 kilograms of ammunition on a single side, the Vasa was indeed the deadliest weapon that travelled on the waves, yet only ‘for a brief few minutes’. The name Vasa, apparently, comes from the Swedish Vasa Dynasty, founded by Gustav Eriksson (1523-1560), Gustav II’s grandfather. The House of Vasa was named after their heraldic symbol: a bundle of golden sheaf of wheat, which is called vase in Swedish (fascine in English). The ship’s importance is made plainly by its name choice. When Gustav II ordered the Vasa – along with three other big warships – to be built, Sweden had been engaged in wars with Poland for quite some time. The Polish king at the time was Sigismund, cousin to Gustav and the one-time king of Sweden between 1592 and 1599. Sigismund was deposed on account of being a Catholic, but the family feud lived on. Sigismund, supported by many, believed he was the rightful king to the Swedish throne. As Sigismund’s replacement, Gustav II swore to defend the Lutheran faith and fought against the ‘pretender’, in the meantime he strived at Sweden’s rise as a great power in Europe. 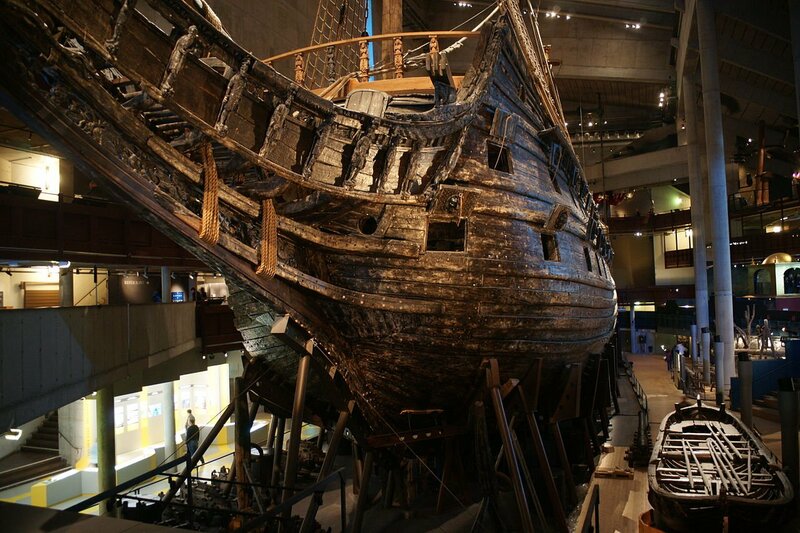 For more than 300 years, the Vasa quietly lay at the bottom of Stockholm Harbour, but she was not forgotten. In the early 1950s, a fuel engineer and amateur archaeologist named Anders Franzén took to himself to search for lost ships of the Swedish navy. After years of thorough research in the archives and consultation with experts, Franzén managed to narrow down his search area for the famous wreck. With little support, he used a coring device of his own design. Luck was on his side: the city of Stockholm carried out a survey of the bottom of the harbour to see if it was possible to build a bridge. A 50-metre-long something showed up on the charter, which everybody believed to be blasting rubble, dumped into the water in the 1920s, when the dock was built. However, Franzén and Per Edvin Fälting, a salvage diver of the navy, believed it to be something else. On August 25, 1956, Franzén’s coring device caught a piece of old black oak. Finally, the Vasa has been found.